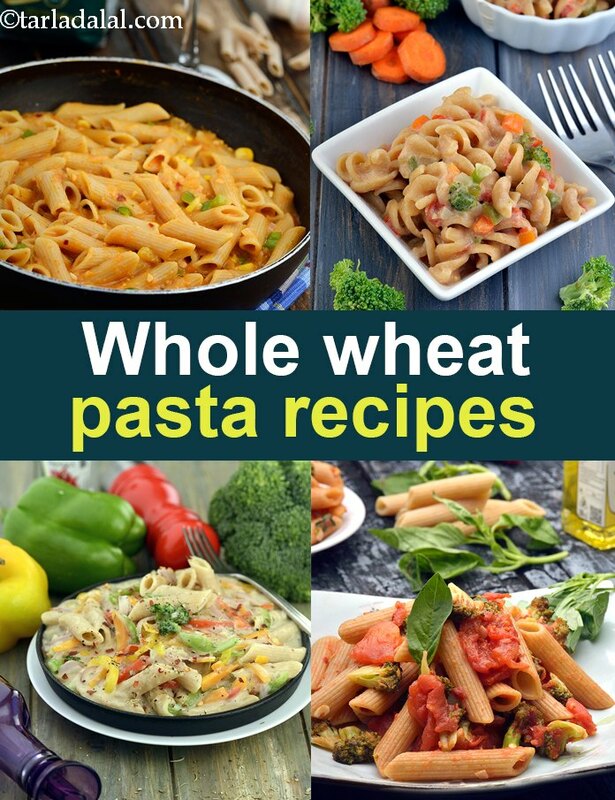 whole wheat pasta recipes. healthy whole wheat pasta recipes.As we all know, whole wheat pasta is far healthier than regular pasta. It's like comparing an Indian roti made from whole wheat flour and a Naan which is made from plain flour. No question, always use the whole wheat option to live a healthier lifestyle. Our top 3 whole wheat pasta recipes are all healthy. The whole wheat pasta in tomato sauce is made with low fat milk and freshly made tomato pulp. There is some sweet corn in the recipe and i suggest you drop it from a health angle. Then we have a super healthy whole wheat pasta in low calorie white sauce made from low fat milk. To it is added lots of vegetables like broccoli, carrots, capsicum and onions which will add fibre to the recipe. Chunky tomato pasta is made from whole wheat pasta, tomatoes, broccoli and basil. Simple and tasty. Yes, this is a super way to make a salad with some whole wheat pasta. See why the pasta and vegetable salad is a must to make. If you thought pasta dishes are always loaded with calories, due to cheese and white sauce commonly used in their preparation, have a look at this recipe – and you will change your mind. Here, a minimal amount of whole wheat pasta is prepared as a salad along with crunchy and colourful veggies, which not only contribute antioxidants and fibre, but also team up well with the pasta to improve the overall texture and flavour. Why feed your kids with unhealthy pasta. Make this vegetable pasta for kids which has loads of fibre rich vegetables tossed into it. Whole Wheat flour used to make whole wheat pasta : Whole wheat flour is excellent for diabetics as they will not shoot up your blood sugar levels as they are a low GI food. Whole wheat flour is rich in Phosphorus which is a major mineral which works closely with calcium to build our bones. Vitamin B9 helps your body to produce and maintain new cells, especially increase red blood cells. See detailed benefits of whole wheat flour and why it's good for you. Enjoy our whole wheat pasta recipes. healthy whole wheat pasta recipes below. Citrus salad, macaroni, veggies, sprouts and fruits combine in a refreshing mint flavoured curd dressing creating a wholesome salad. Keep hunger pangs at bay and get back to shape! Enjoy the penne pasta tossed in white sauce in this delightful Penne in white sauce recipe. The penne pasta is prepared and then enrobed in a creamy freshly made white sauce and enjoyed as a main course meal with soups. This recipe will taste much better if served a little warm with a hot cup of coffee. Easy to digest and nutritious sandwich made using minimum spices especially for children. A fine grain pasta salad platter to be enjoyed during the mango lush summer season. A soup can be a salad. One can make very easily and enjoy!